It's time for an exhaust system revolution... A variable back-pressure exhaust valve that makes your car quiet at light loads, and yet still lets it breathe when the hammer's down! Last issue we covered the building and fitting of a high performance exhaust to a Commodore VL Turbo. It was an exhaust system fairly conventional in nature - 3-inch after the first flange, high-flow cat, mandrel bends and a single straight-through muffler - although it has to be said that it was far cheaper than most exhausts of this type! And, as you'd expect with just the cat and single muffler, it was also louder than the standard exhaust. Not really loud mind you, though prob too loud for some people's tastes. But as we then implied, we have a secret weapon at our disposal. It's one that can make this exhaust - and pretty well any other - quiet enough to pass legal tests, while still being able to flow an awesome amount of exhaust gas. And the weapon that let's us do this? It's a device that effectively makes the exhaust a variable flow design, so that for all intents and purposes the exhaust is small at times of low load - and a whopper when your foot is down hard! Invented by Kevin Davis of the New South Wales town of Wollongong, the design was developed initially as a result of Kevin getting sick of being booked for excessive exhaust noise. Surely, he thought, there must be a better way of getting low noise than just fitting a smaller or more restrictive exhaust system? The result of those musings was the VariFlow concept. Some three years later the design has passed through a number of iterations, with most of the changes aimed at making the valve live under the combined stress of very high temperatures and corrosive exhaust gases. 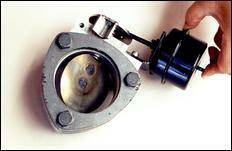 The heart of Kevin's VariFlow system is a variable opening valve that's located within the exhaust. This assembly consists of a butterfly constructed from 316-grade stainless steel, mounted within a cast alloy housing. 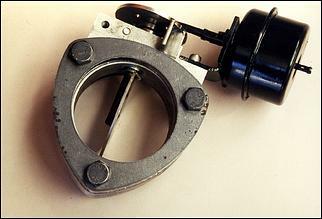 The valve is opened and closed by a large vacuum actuator. The aluminium housing containing the valve is bolted into the exhaust pipe, with this made simple by the provision of two 10-mm steel flanges. Each flange is welded to a section of exhaust pipe, with the aluminium housing then sandwiched in between, being securely held in place by through bolts. 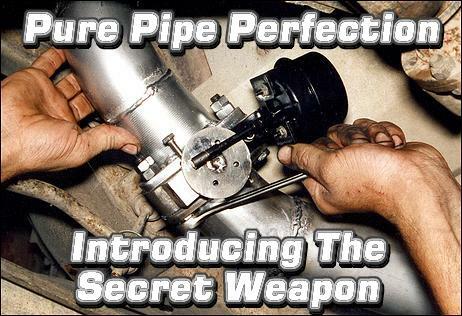 This arrangement allows the easy removal of the valve if that's required, and also overcomes the problem of trying to weld the alloy valve body to the mild or stainless steel exhaust pipe. 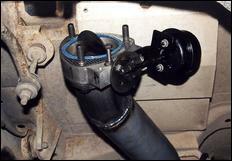 The insertion of the valve into an already constructed exhaust is also straightforward. And if that was all there was to it, you'd still have a pretty good system! The exhaust valve would be nearly closed at lowest engine loads (highest vacuum) and most widely open at highest loads (lowest vacuum). Straightaway you can see that this will give a quiet exhaust system on cruise, and a loud (but excellent flowing) system when you're accelerating hard. However, what about if you're free-revving the engine at idle - as happens when the authorities are testing your car for noise? In that case, as manifold vacuum decreases, the valve will start to open, heightening noise. To avoid this problem, and also to allow the system to work even more effectively in normal use and on turbo cars, Kevin Davis has developed a full control system. Housed in a large (155 x 105 x 80mm) alloy box, the control system consists of a very sensitive user-adjustable pressure switch, two solenoid valves, and an electronic delay circuit. So how does it work? If the sensed exhaust backpressure is greater than the switch-on point of the pressure switch, the switch electrically opens a bleed solenoid, which lets some of the vacuum escape from the line leading to the actuator diaphragm. 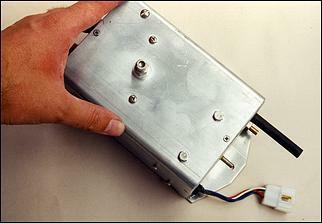 At the same time, another solenoid is switched to dump the exhaust backpressure signal. The result of this is that the exhaust valve starts to open. As the valve opens, backpressure falls, so opening the backpressure switch. This cuts off power to the vacuum and exhaust gas pressure bleed solenoids, re-establishing the backpressure signal and vacuum feed to the actuator. The valve then starts to close. Consequently, backpressure again starts to rise, starting the whole cycle all over again. In fact, the cycle can happen at up to eight times a second, resulting in the backpressure being maintained within a narrow window. 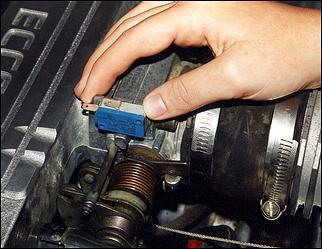 Setting the sensitivity of the pressure switch determines how much backpressure is held in the exhaust. Note that this elegantly simple system means that the valve responds in its actual opening angle to exhaust flow, always holding the same exhaust backpressure. This means that if you set the system to provide (say) 2 psi of backpressure at moderate loads, the valve will automatically open just far enough that a 2 psi backpressure is also maintained at one-quarter load, one-half load - or three-quarters load. (Obviously the pipe diameters and mufflers will need to be able to provide 2 psi or less backpressure if this example is to be realised in real life!). That's radically different to the characteristics of a normal exhaust, where backpressure at low loads is usually zero, rising as load increases. However, there will be some situations where the dialled-in backpressure will still result in a power deficit, especially if you set the backpressure relatively high to keep the car quiet in normal driving. To overcome this, a micro-switch is mounted on the throttle and the facility for a dashboard over-ride switch is also provided. At full throttle the microswitch trips the solenoids, resulting in the butterfly rapidly moving to its fully open position. Flicking the dash switch does the same - it's the one to touch if you just want max performance and damn the noise! In order that the valve stays open during gearshifts made between doses of full throttle, the electronic delay circuit maintains the valve in its fully-open position for 10 secs after the full-throttle switch has last been tripped. In addition to the valve and control box, a small tub of components is supplied in the VariFlow kit. These comprise two one-way vacuum check valves, two different restrictors, three hose clamps, the micro switch, a small diameter length of steel pipe (used to take the exhaust back-pressure input), a LED and the necessary components to plug into the control box harness plug. You will need to supply your own manual override switch, 5 amp fuse (and holder), electrical cable, vacuum lines and additional hose clamps. The VariFlow butterfly can be inserted into any section of your exhaust, however the preferred location is towards the rear of the system. This location has two advantages - it reduces the temperatures to which the valve is exposed and it also allows those noise suppression devices (eg cat converter, muffler, resonator) to be subjected to the set backpressure and so work more effectively. Note that the valve is quite compact (especially when compared to an average muffler) and so it is easy to fit it in place of a factory muffler, or (in the case of the VL Turbo) where the pipe rises to go over the rear axle. The valve has an optimal flow direction and should always be fitted with the actuation canister uppermost to provide better ground clearance. 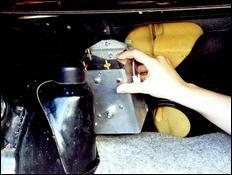 At the same time as the valve is being fitted, a pressure sensing tapping needs to be made in the exhaust pipe. This is preferably located close to the engine, with the provided short length of steel tube able to be inserted through a drilled hole and then welded into place. 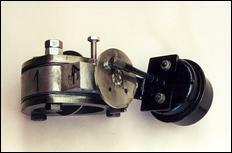 The throttle position microswitch was mounted on a small bracket, being located so that it was triggered at throttle angles above 80 per cent. Once that was installed, the dash override switch (and its associated indicator LED) could be put into place, followed by the electrical wiring. For this we used an in-line 5A fuse and picked up a 12V source from an ignition-on circuit. So how well did it work? That's a story for next week, when we calibrate the system step by step.